All too often when a artistic painter is just starting out they pick a selection of brushes without really paying attention to what they’re doing. There are brushes for every different kind of paint, different widths, different materials, and the handles are different lengths as well. If you just grab a variety of brushes, you’ll most likely get some of the right ones, but then when you start to paint, which ones are best for the painting that you’re doing? Well, let’s take a quick look at that now. 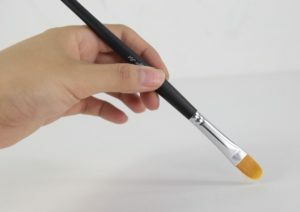 Everyone knows that they need a different shape or size of brush depending on how small or large of an item they’ll be replicating on the canvas. But, there are also short and long handles too. First, make sure that the handle is comfortable for your hands, if you’re doing a lot of painting, it can become tiring for your wrist and fingers having the wrong size. For those who paint indoors and inside their studio, a short handle would be better option. Those who are painting standing up, usually oil painters and plein air painters, a long handle may be a better option. But there are no rules you can try and see which of them work best for you. Brushes with the shorter handles are easier to control in tight spots and doing intricate things, while those with longer handles will be better for painting larger areas such as the background of your painting. Plus, many painters like to stand farther back from the canvas and use more of an arm sweeping movement to add flare to their work and longer handles are better for that. The ferrule is the metal clamp that holds the handle and the brush together. There are some cheap brushes in every store that have loose ferrules, avoid those at all cost. In fact, before you buy a brush take the time to push, pull and wiggle the ferrule to make sure it’s secure. Loose ferrules are very frustrating and inaccurate as well. A loose ferrule may mean the brush will shed hair into your painting. This may ruin your work, and trying to fish out the hair can smug your strokes. There are brass, copper, aluminum and other types of metal ferrules, they should be long enough to hold the handle and the turf. There are also different materials used to make the heads, some of the bristles or hairs are soft and pliable while others are more stiff. If the paints that you’re using are thinner, more watered down, then you’ll want to use the soft bristled brushes. However, when you have some thick bodied paint, you’ll want stiff bristles instead. The softer bristles will also usually hold more paint, which will save time when you have to keep going back to fill up with paint. When just beginning your painting hobby or career, it’s good to start with a large selection of different sizes, shapes, bristles, and handles, plus add a few really high quality brushes as well. Then, as you gain experience and knowledge, you’ll find that you have favorites for each different task so you can stock up on several of each of those brushes so you always have some on hand. Six well balanced short handle brushes. 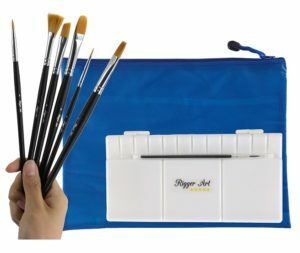 All the art supply you need to be a painter on the go – Click here to order the bundle from Amazon! 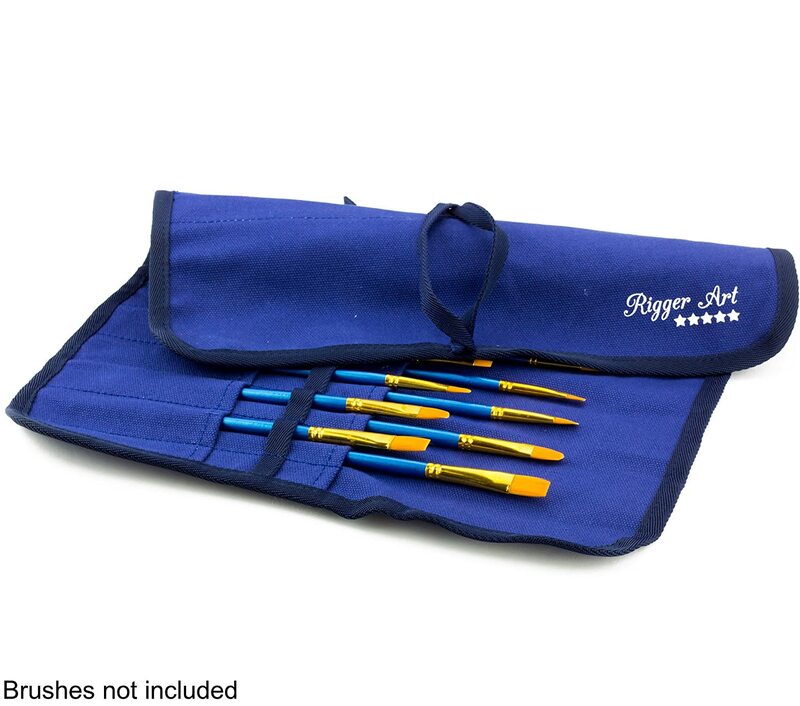 Get started with premium art supplies every painter needs, either to paint at home or en plein air. This entry was posted in Painting Brushes, Videos and tagged Acrylic Brushes, Newbie Painter, PaintBrush Shapes, Paintbrushes Set, painting brushes, Rigger Art Brushes, watercolor brushes by RiggerArts. Bookmark the permalink.